For my second day interning at Seattle Southside, I had the opportunity to experience a whole different side of the beautiful city and take a day trip whale watching. I was skeptical at first, not thinking that we would see many whales in the six hours we would be gone. The most challenging part of this trip was navigating into Seattle and figuring out parking. For somebody like myself who lives far outside of the city, I recommend taking the light rail into the city for a stress free way of transportation. This is a very convenient way to get into the city and not have to worry about parking fees or searching for a parking space. I was to meet outside of the Grand Hyatt hotel at 8:15 am where I was picked up by Tours Northwest. The bus was right on time, and the tour guides were ready to go and full of energy. The bus ride took about 30 minutes, but was well worth the amount of trivia I learned about the city. Both guides were very energetic and immediately introduced all of us to each other to get a better idea of who would be on this whale watching adventure. This particular tour bus offers transportation from different hotels around the city with pick up and drops off included. 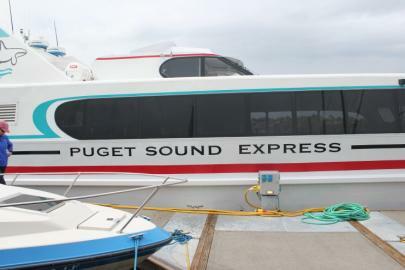 We were greeted by Puget Sound Express right outside of the bus in Edmonds, and were taken on board right away. The whale watching tour is run by a family that has done this for 30 years, and has integrated all of their children into the business. Pete and Sherri are the main crew, with their children Ashley and Christopher who assist on board as well. They were so welcoming and immediately made me excited for the rest of the day. From the minute I stepped on the boat to when I stepped off, I was continually checked on, and made sure that I was comfortable. I have been on different whale watching tours before, and this was by far the best one I have been on. Not only did I get to see multiple whales, the experience that the crew gives is one that can’t be beat. 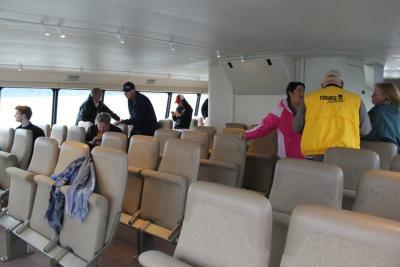 The crew was extremely hospitable, and was very knowledgeable about whales. I learned more than I expected about whales, and felt like an expert by the end of the day. The biggest perk of this whale watching boat is the speed capability. 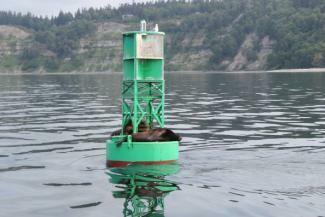 It is the highest speed foilcat on this side of the state and gets up to speeds of 40 mph, allowing many different locations to be reached within the six hours. This was very noticeable when we were going from location to location, we were never traveling very long without having something to stop and see. 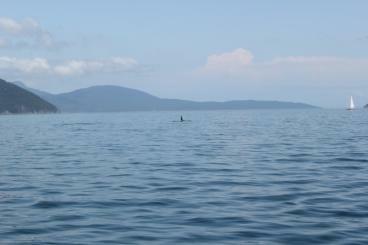 Within six hours we were able to travel up through the San Juan Islands, and see multiple whales throughout the day. I was amazed by how much whale action we got. I was able to see six whales throughout the day, and we stopped the boat to take lots of pictures, and make sure everyone got a good look. 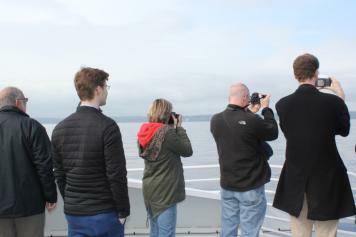 Something that sets Puget Sound Express apart from other whale watching tours is that they guarantee whale sightings or another trip for free. When I was first told I was going whale watching I was imagining an outdoor boat, and packed for that expecting it to be cold and wet since this is Seattle. This was not the case; the inside of the boat was amazing with comfortable chairs, snacks and coffee, and a bathroom on board. A complimentary feature of the tour group is the Blueberry Buckle that is offered on the boat. This is a family recipe that Sherri makes fresh each morning before the tours go out. Tours Northwest includes coupons for each passenger on board to get a piece of this family tradition. Tours Northwest does an amazing job at making this tour easy and convenient. With door to door service this trip was stress free, and was a great way for me to freshen up on my Seattle knowledge and see some whales while doing so. Pete and Sherri and the rest of the Puget Sound Express crew topped any of my other whale watching experiences, and I will highly recommend any local or tourist to call Tours Northwest and book their Whale Watching experience.